The iPhone X is a marvelous phone, but one of the biggest drawbacks of the device is its ridiculously high price tag. It has a starting price of $999, which goes up to $1,149 for the 256GB model. The handset costs close to $1,500 in several countries such as Russia and India. Price was the main reason the iPhone X failed to trigger a massive upgrade cycle. A new report coming out of Asia has revealed the iPhone X2 and iPhone X Plus price. 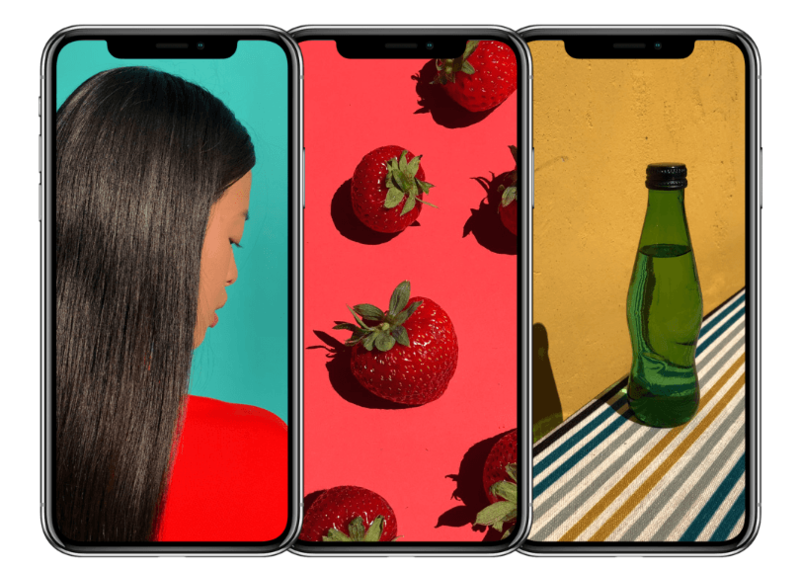 The report indicates that Apple will reduce prices with its 2018 OLED iPhones. According to multiple reports, Apple will release two OLED iPhones and one LCD iPhone in September this year. The OLED iPhones are currently dubbed iPhone X2 and iPhone X Plus while the LCD variant is referred to as iPhone X SE by the rumor mill. Citing supply chain sources, Taiwan-based Economic Daily News reports that the iPhone X2 and iPhone X Plus price would drop by $100 compared to the iPhone X.
Apple is expected to bump up the price of LCD iPhone by $100, though. KGI Securities analyst Ming-Chi Kuo has told investors that the LCD iPhone would have the same bezel-less design and Face ID as the iPhone X. But Apple will remove the 3D Touch functionality and include only a single camera lens to keep its costs lower. Kuo has claimed that the LCD iPhone would cost in the same range as the iPhone 8. However, the Economic Daily News has learned from its source that the LCD iPhone would have a starting price of $799. The second-generation iPhone X would go on sale at $899, down from the iPhone X’s $999 starting price. The iPhone X Plus price would start at $999 for the base model. Industry experts were anticipating that the larger iPhone X Plus could be priced at $1,099. Though the iPhone X was Apple’s most expensive smartphone ever, the company had also launched an iPhone 8 priced at $699 and the iPhone 8 Plus at $799. The latest report corroborates with an earlier report from DigiTimes Research, which claimed the second-generation iPhone X would be 10% cheaper to manufacture than its predecessor. It would allow Apple to reduce the iPhone X2 and iPhone X Plus price. DigiTimes Research analyst Luke Lin noted that the iPhone X2 would be the most affordable model planned for this year. Lin says Apple was working on an LCD iPhone, but scrapped the project in mid-February. The Economic Daily News added that Samsung Display was preparing to start OLED production for the next-gen iPhones in May. Samsung remains the sole supplier of OLED panels for iPhones. Apple has been trying to diversify its OLED supplier base, but other suppliers including LG Display don’t yet have the capabilities to meet its demands. According to the Taiwanese publication, Samsung will produce only small quantities of OLED screens in May. The company will double the output in June, though. It is unclear why Samsung is starting the iPhone OLED production earlier than usual. It could be that Apple will launch two OLED iPhones this year, so Samsung might have received a larger order and is trying to meet the demand by starting production early. It also indicates that all three iPhones would launch simultaneously in September. Last year, Apple released the iPhone 8 and 8 Plus in September, but delayed the iPhone X launch until early November due to production issues. The current iPhone X might not have sold in large quantities as investors were expecting. But data from Counterpoint Research shows that it has proved incredibly profitable for Apple. According to Counterpoint Research, the iPhone X accounted for 35% of the total smartphone industry profits in the fourth quarter of 2017. That’s quite surprising given the iPhone X was available only for two months during the quarter. The iPhone 8 accounted for 19.1% of the smartphone industry’s profits while the iPhone 8 Plus captured 15.2% profit share. 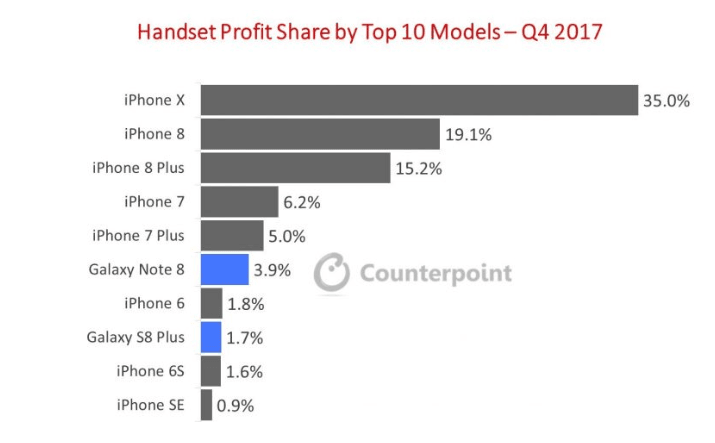 Apple smartphones occupied 8 out of top 10 smartphones by profit share, according to Counterpoint. The other two devices were Samsung’s Galaxy Note 8 at sixth place and Galaxy S8 Plus at eighth rank. In total, Apple handsets captured a staggering 86% of the smartphone industry’s profits. Counterpoint Research added that the longer software support offered by Apple helped older iPhones stay relevant and keep minting money for the company. The research firm pointed out that the iPhone X alone earned five times more profits than the combined profit of more than 600 Android vendors in the fourth quarter of 2017. Another report claims that Apple might be planning to refresh the budget-friendly iPhone SE line. Cosmomac has discovered references to yet-to-launch iPhone models in the Eurasian Economic Commission database. The Eurasian regulatory database has provided accurate details about the iPhone 7, AirPods, iPads, and MacBooks in the past. Cosmomac speculates that the iPhone SE 2 could be unveiled in May/June.